It may still seem early in Kamala Khan's superhero career, but she's already facing the end. Marvel Comics has announced “The Last Days of Ms. Marvel,” beginning in Ms. Marvel #16. The “Last Days” arc sees the return of artist and Kamala Khan's co-creator Adrian Alphona on art duties, with co-creator and series writer G. Willow Wilson leading the young Ms. Marvel into her biggest adventure yet. "When the world is coming to an end, do you accept that it's over…or do you keep fighting for those you love? When losing is inevitable, how do you define yourself? In the Last Days story arc, Kamala has to grapple with the end of everything she knows, and discover what it means to be a hero when your whole world is on the line," says Wilson. 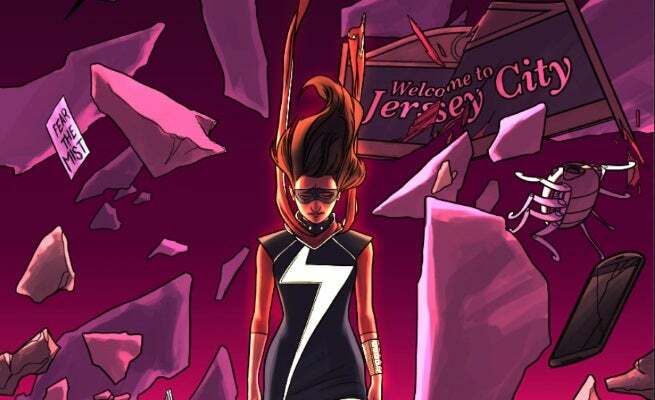 As the final incursion draws near, Ms. Marvel rushes to Manhattan, but how does a young hero like Kamala deal with the end of everything she's ever known? On top of that, while Kamala is busy in Manhattan, villains are making trouble in her hometown of Jersey City. "She will face a very personal enemy as the chaos in Manhattan spills over into Jersey City," Wilson teases, "and she will be forced to make some very difficult choices. There will also be a very special guest appearance by a superhero Kamala--and the fans--have been waiting to meet for a long time. The end of the world has never been this exciting." Like many of the other heroes of the Marvel Universe, Ms. Marvel will be forced to deal with the end of a world she's fought to protect. Kamala Khan's "Last Days" begin in Ms. Marvel #16.